Rep. Frank Farry (R-Bucks) explains a new state law (Act 121), which requires multifamily dwellings with a fossil fuel-burning heater/appliance, fireplace or an attached garage to be equipped with a carbon monoxide alarm, during a community event he hosted on Jan. 17, at the Langhorne-Middletown Fire Company station. Farry was a strong advocate for the legislation. LANGHORNE – Rep. Frank Farry (R-Bucks) today invited members of the community to attend a free, public event he hosted at the Langhorne-Middletown Fire Company Station No. 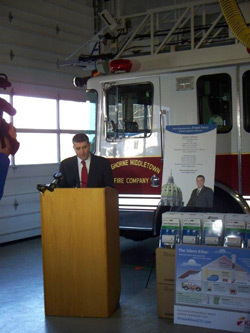 22, to bring awareness to a new state law regarding carbon monoxide alarm requirements. Act 121 of 2013, known as the Carbon Monoxide Alarm Standards Act, requires multifamily dwellings with a fossil fuel-burning heater/appliance, fireplace or an attached garage to be equipped with an operational, centrally located and approved carbon monoxide alarm. The law takes effect in June 2015. Although the Senate measure was ultimately signed into law, Farry championed identical legislation in the House and held a public hearing on the issue in Middletown Township in 2012. The event featured Philadelphia Fire Commissioner Lloyd Ayers; Kim Everett, coalition coordinator, Bucks County Safe Kids Coalition; Donald Konkle, executive director, Pennsylvania Fire and Emergency Services Institute; Mary K. Smithson, Bucks County resident and Act 121 advocate; a representative from Middletown Township’s Office of the Fire Marshal; other officials and local emergency service responders. Additionally, Kidde, a manufacturer of fire safety products, donated carbon monoxide alarms to Langhorne-Middletown Fire Company, which were distributed to attendees.